This Sherman hotel offers classically furnished rooms equipped with free Wi-Fi and a cable TV. It features an indoor pool and is just 6.2 miles from North Texas Regional Airport. All rooms at the Hampton Inn Sherman are warmly decorated and include a spacious work desk and a coffee maker. A hairdryer and free bathroom amenities are provided in every room. Guests can enjoy free access to the on-site fitness room or relax in the jacuzzi. The hotel’s business center offers a computer with free Wi-Fi. The Sherman Hampton Inn is only 4 miles from shopping at Midway Mall and Stone Creek Country Club is a 6-minute drive away. The Red River Railroad Museum is 11 miles away. 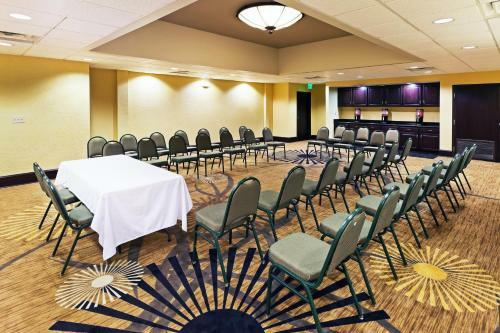 the hotel Hampton Inn Sherman so we can give you detailed rates for the rooms in the desired period.